The riffs are flowing; the dress code is black and the Star & Shadow reeks with the stench of sweat and leather… As if the five previous Byker Graves just weren’t heavy enough, Newcastle’s most macabre festival is now a fully-fledged weekender, serving a healthy horde of headbangers with a pair of disparate yet equally weighty bills. Unfortunately, Bristol’s Bodyharvest veer towards the cartoonish end of the spectrum; like a band whose formative meetings featured a checklist of essential clichés. I don’t think I was alone in reaching this verdict either – at least judging by the complete non-response to their repeated calls for a circle pit. Perhaps I was the only one who heard… it can’t be easy being understood when ‘M3TUL VOICE’ is your only setting. In fairness, their cause is hardly helped by being sandwiched between the two best bands of the day. A last-minute stand-in for Horsebastard, Northampton’s The Atrocity Exhibit prove both a mightily pleasant surprise and the perfect understudy to P.L.F. who, having travelled all the way from Texas, take barely 30 minutes to rip through a headline set featuring almost as many songs. At two and three members, respectively, it’s worth noting that they’re also the acts with the most pared-down line-ups – proof that limited manpower (and, to be clear, we are very much talking about MANpower) need prove no barrier to breakneck sonic malevolence. They’re both stupidly fast, and all of their songs are completely indistinguishable, yet this shouldn’t detract from the prowess on show. P.L.F.’s Bryan Fajardo in particular is a restless behemoth behind the drumkit – though given their intensity it’s tempting to wonder whether the chants of “20 MORE SONGS!” risk landing both bands in A&E! It’s fairly common practise for festivals to slow things down come Sunday, and in a sense Byker Grave follows suit. Indeed, if day one was ‘the fast day’, then day two is all about primitive, bone-crunching heaviness. In today’s company, stoner rockers Green Lung seem comparatively lightweight. The Londoners do, however, know their way around a good groovy riff; while the verve and exuberance of frontman Tom Templar is just about enough to veil some pretty banal lyrics. Now, though, we move onto the truly heavy stuff, beginning with their capital contemporaries Wren. 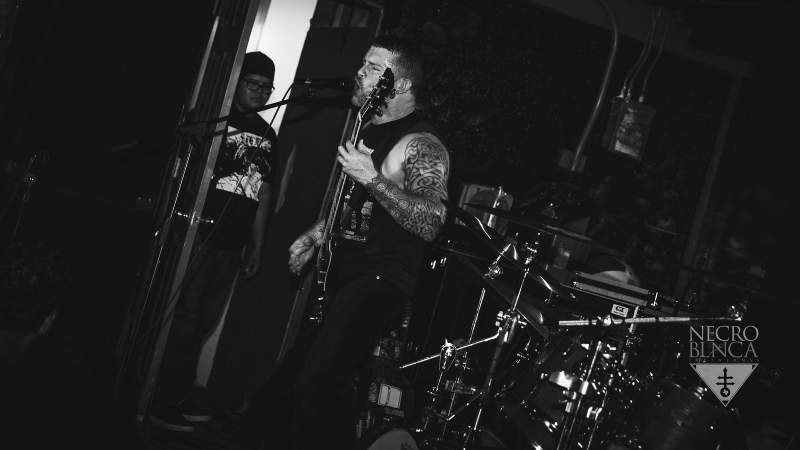 Chugging along at the ominous, destructive power of a primeval tank, their slow-motion post metal is a truly weighty proposition, with each hulking, drawn out note hitting its mark like a hostile shell. It’s a glorious offensive, but things go up another notch with the arrival of Conjurer. A devastating showcase of March’s superb debut album Mire, the rugby outfit’s set is as epic as it is uncompromising, lurching between blitzkrieg ferocity and thunderous, guttural sludge with a fluidity which infuses progressive tendencies with intense, unpredictable thrills. They’re the tightest, the most dynamic and – for me – the best band of the weekend, though through sheer blunt force alone headliners Conan offer them a serious run for their money. Inciting a sea of banging heads and flailing hair, the scouse outfit’s ‘caveman battle doom’ is so low-end you can scarcely decipher individual riffs, with everything instead melding into one gnarly, cavernous rumble. There comes a point where you begin to wonder whether it really needs to be this heavy (if Sabbath, Electric Wizard, Sleep et al deemed it unnecessary, shouldn’t that tell you something?! ), but it’s mighty, dumb fun nonetheless; cutting straight to the core with cannonfire drums and bone-rattling vibrations. As someone who’s rarely impressed by such things, I also find myself unusually drawn to Jon Davis’s matt black Gibson Les Paul – a truly sublime specimen! I’m not sure my ears share this enthusiasm, though after a weekend of remorseless torture they’ve long since had it anyway.